DJ How many 6k know the reason behind in the diagram below? Answer: a black play at a is not sente against White's corner group. Therefore White accepts a local loss (only one more point of territory against a difficult-to evaluate increase of thickness for Black) because it negates a sente move to the opponent: this is judged equal by pro's. How many advanced amateurs, even at Shodan's level, are really able to perform such an evaluation on their own, without being told beforehand???!!?? Alex Weldon: I'm with Coconuts on this one. 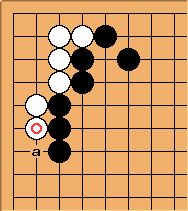 If someone is single-digit kyu and can't figure out without being told that the purpose behind that move is to avoid being completely shut off from the left side in sente, there's a serious hole in their knowledge that needs addressing. Charles On the other hand, there is a valuable general principle on suji here: crawl once more, to prevent the blocking move becoming sente. This is an exception to 'the second line is the route to defeat'. Bill: It is also an example of the proverb, Play double sente early. And it is not really a local loss. Compare Black's thickness with his thickness if he gets to play with sente. For follow-up moves see 33 Point Invasion Query 5a. Moved from A Zen way to joseki.